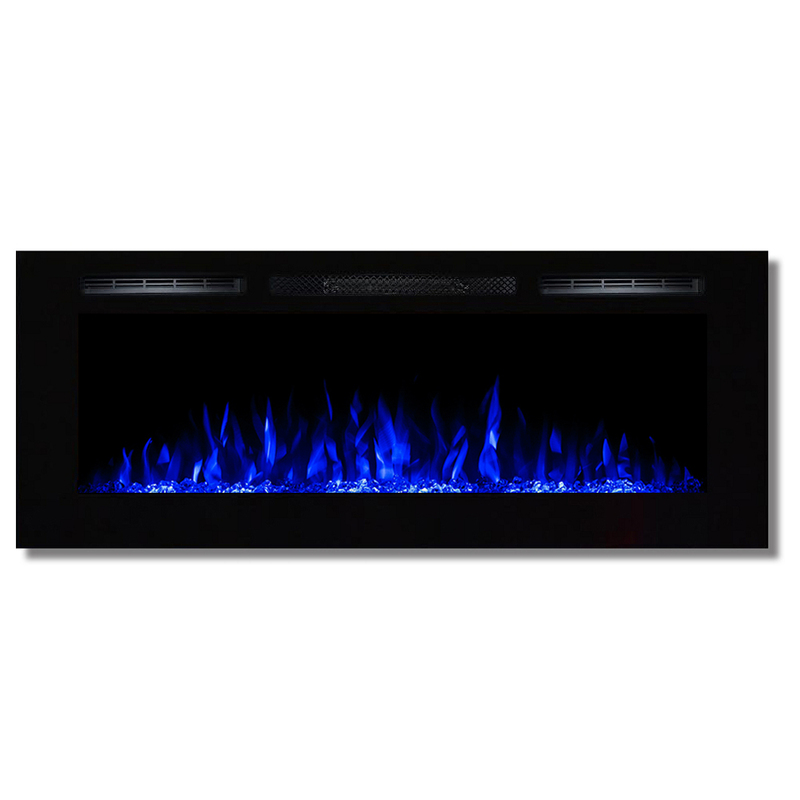 If you want to add a dynamic and vivacious vibe to a room, the built-in 50" Crystal Fusion fireplace will do just that. Its perfect length and proportion, as well as its sleek design, makes it the showpiece of any room it is placed in. The realistic flame coupled with its innovative Crystal style, makes the Fusion the most revolutionized fireplace on the market. 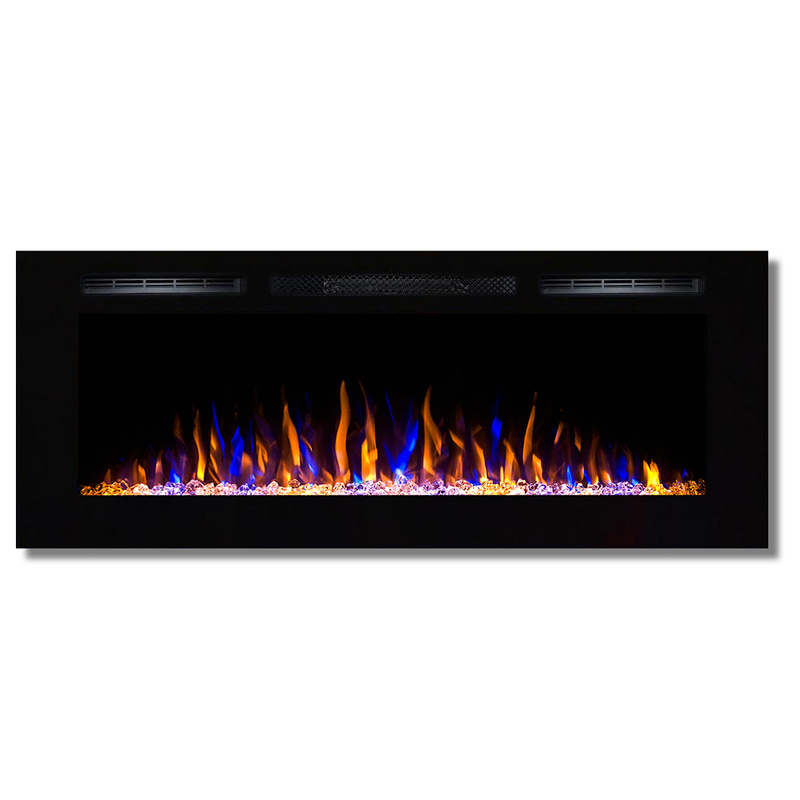 3 Color Changing, Smokeless Ventless Wall Mounted Recessed Built In Electric Fireplace Insert with Heater, 3 settings of high, low, and no heat (only flame effect). Wall mounting hardware included; Remote included to control the flame and heat (batteries not included). Includes a powerful fan-forced heater. 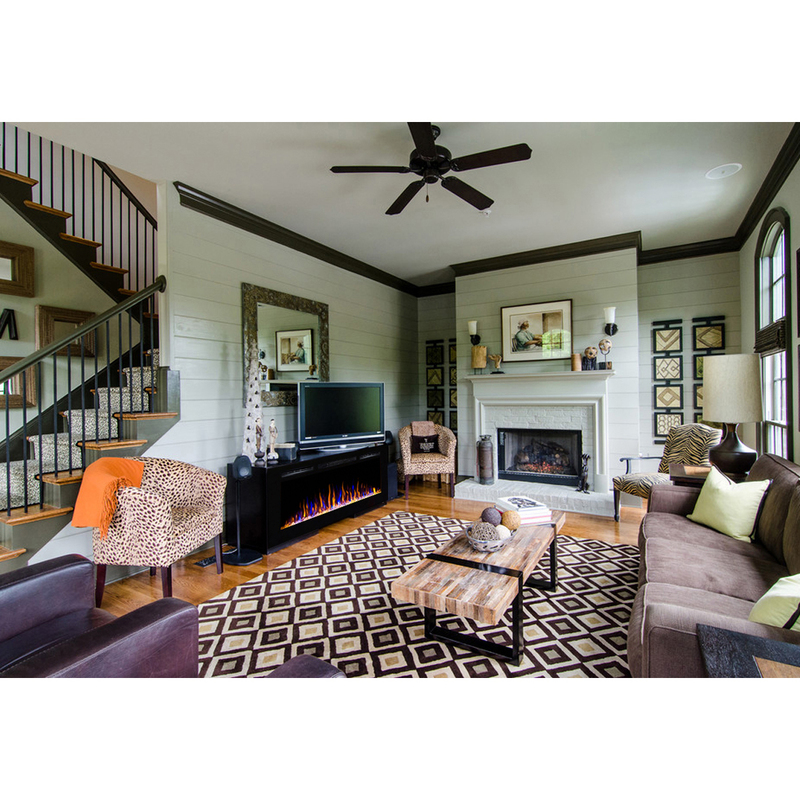 This recessed electric fireplace heater requires no ethanol, gas, chimney, mantel, stove or gel cans. Timer offers automatic shut off of 30 minutes to 7.5 hours. 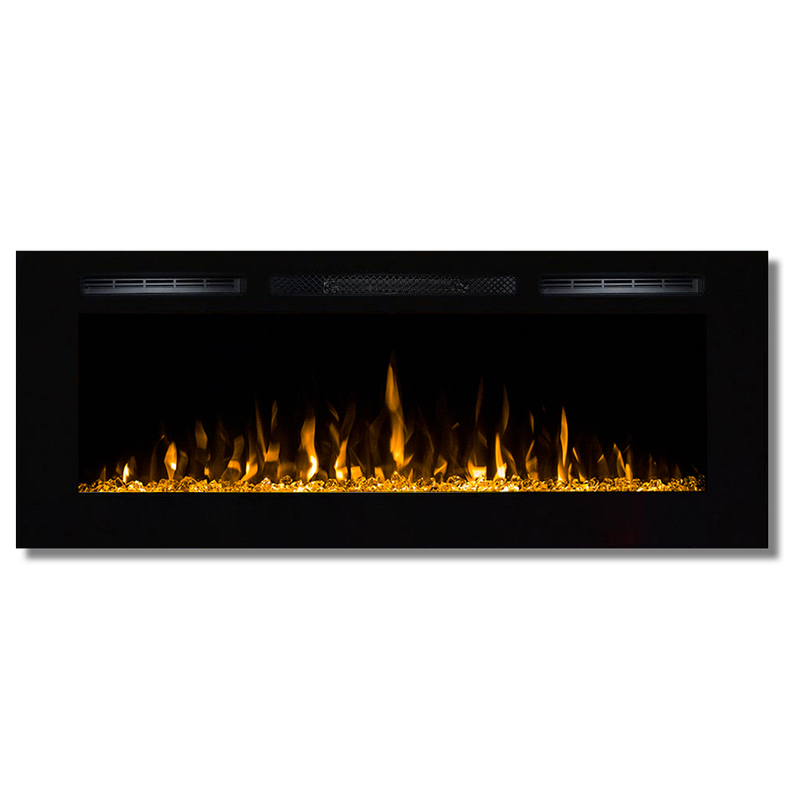 This indoor built in electric fireplace insert is completely vent free and perfect for any modern or traditional home. 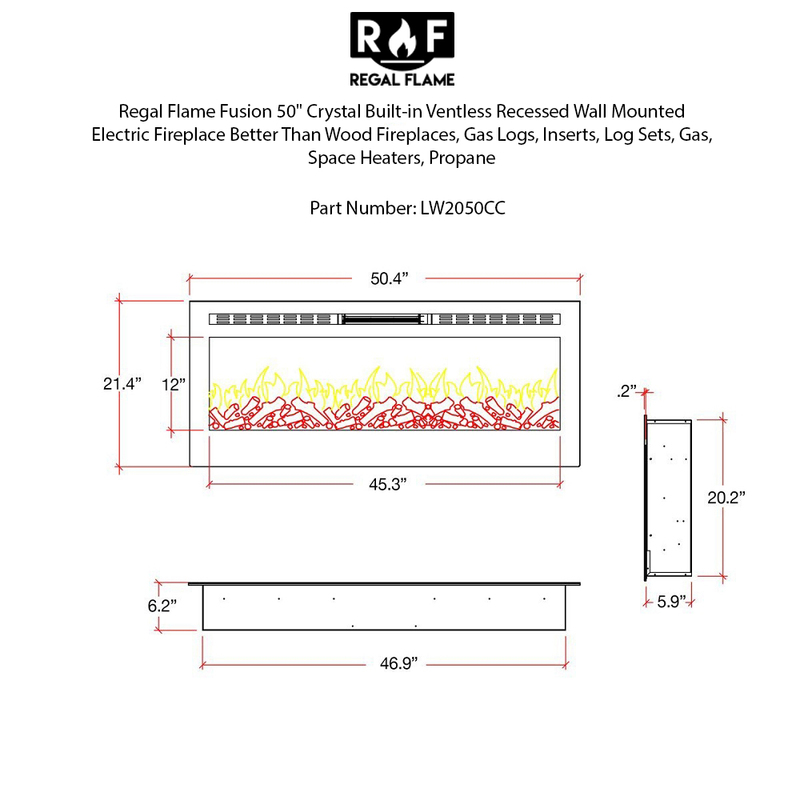 Overall Dimensions: 50.4W x 5.9D x 21.4H Inches - Flame View Dimensions: 45W x 12H Inches - Firebox Dimensions: 46.9W x 20.17H x 5.87D Inches. Room Coverage 400 sq. ft.
We want you to be absolutely satisfied with every purchase from Regal Flame, so if for any reason you are not, we will refund 100%. Within 14 days, simply contact us for a return authorization number and instructions. All we will ask is that you return the item unused, in original packaging, in sellable condition. Unfortunately, there is an vast number of unauthorized internet retailers who cannot guarantee your satisfaction with warranty and service issues. Buying from a company that you trust and that manufacturers endorse is imperative. We are one of just a few certified authorized dealers that have a direct relationship with each manufacturer. 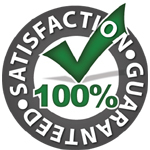 This certifies every purchase you make will receive the best price, full warranty and guaranteed service coverage in the rare event of service issues. Any returned item(s) will be inspected. Items received that are unused, in original packaging and in sellable condition will be refunded 100% of the original product purchase price less any shipping costs incurred by us. This product ships within 1-3 business days and are delivered in 5-7 days! Our items ship via Federal Express at no additional charge within the lower 48 US states. All other locations and countries will be quoted. Shipping time varies depending on your location in the US or Canada. You will receive an email at the time of shipment with tracking and receiving information. NOTE: We cannot be held responsible for the cost of repairs or replacement of damaged items if there is no notation on the freight delivery receipt. If your item is shipped via common carrier (Federal Express or UPS), then you may accept a package and notify us of any damage within 72 hours. If your item is shipped by LTL (large carrier/truck), please inspect the product for any damage prior to accepting the package. If you have any suspicion of damage, please note it on the bill of lading (delivery receipt) as "damaged." Please notify us of any damage within 72 hours. I had purchased one for Christmas and had just recently purchased another for my office space. Gives my house a completely new look. Very pleased. Love my fireplace it add some much class to my living room! Remote needs direct line of sight but the crystals are beautiful and add some modern touch to my living space. 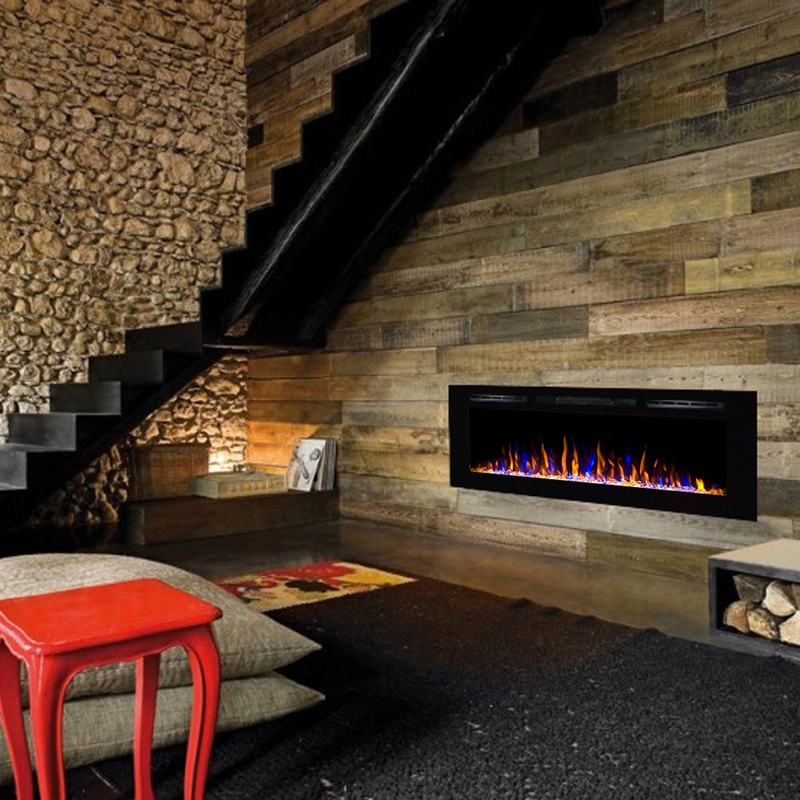 So you want to add realistic looking, contemporary fireplace to your condo or home, but you don't want the hassle & expense of a typical gas or wood fireplace? This is a GREAT and affordable option. We saw one of these units during a tour of a model home this past winter, and we just loved it. So of course we looked for the brand and model number and quickly saved it to the Amazon wishlist. I installed it yesterday in less than half an hour. It looks beautiful, and works as advertised. I can use the remote to turn the unit on from 20' away with no problem. Heat or no heat with your flames? It's your call. Either way, this is a screaming bargain for the quality and visual impact this fireplace makes. Highly recommended. Copyright Regal Flame. All Rights Reserved.